The <th> tag is used to specify a header cells in the table. 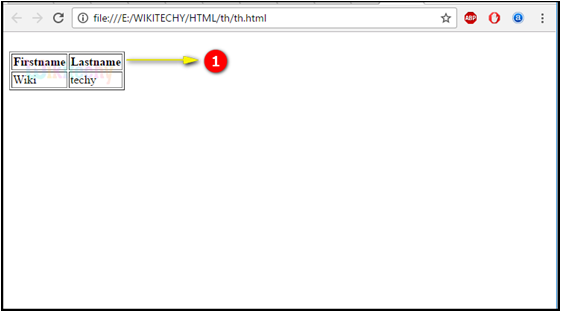 Header cells, which specifies the header information using <th> tag. Standard cells, which specifies the data using <td> tag. The <th> tag supports Global Attributes and Event Attributes. abbr, align, axis, bgcolor, char, charoff, colspan, headers, height, nowrap, rowspan, scope, sorted, valign, width attributes are supported. All layout attributes are removed except colspan, headers, rowspan, scope and sorted. 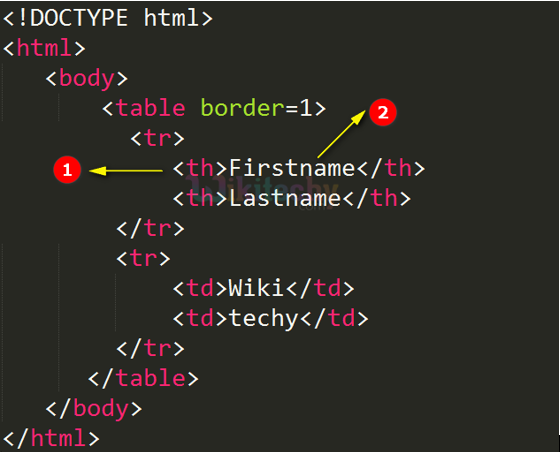 <th> tag - is used to defined the content of the table’s header elements. Firstname is the data of the header table which is shown in dark letters. Here we can see the output Firstname and lastname defines the table header.